The following audio examples were recorded with drummer Peter Zimre in a large, high-ceilinged converted loft space. 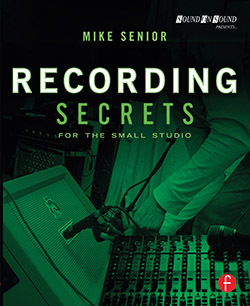 The microphones used were Avantone CK1 small-diaphragm condenser mics, preamplified via an Audient ASP008 multi-channel microphone preamp and recorded digitally without any signal processing. This microphone setup used five Avantone CK1 microophones with their cardioid capsules to record the angular dispersion of four different cymbals: a nineteen-inch Sabian AAX X-Plosion Crash ('Crash 1', shown below); an eighteen-inch Sabian AA Medium Thin Crash ('Crash 2'); a twenty-inch Zildjian K Custom Ride ('Ride'); and a nineteen-inch AAX X-Treme Chinese ('China'). ANGLES IN THE VERTICAL PLANE: With the cymbal set up on a stand about 1.3m from the floor, the mics were placed on the vertical plane of the player at five different angles to the cymbal: directly above the cymbal; 30 degrees from vertical; 60 degrees from vertical; on the horizontal plane of the cymbal; and 30 degrees below the horizontal plane of the cymbal. All mics were approximately 60cm from the cymbal's bell in each case. 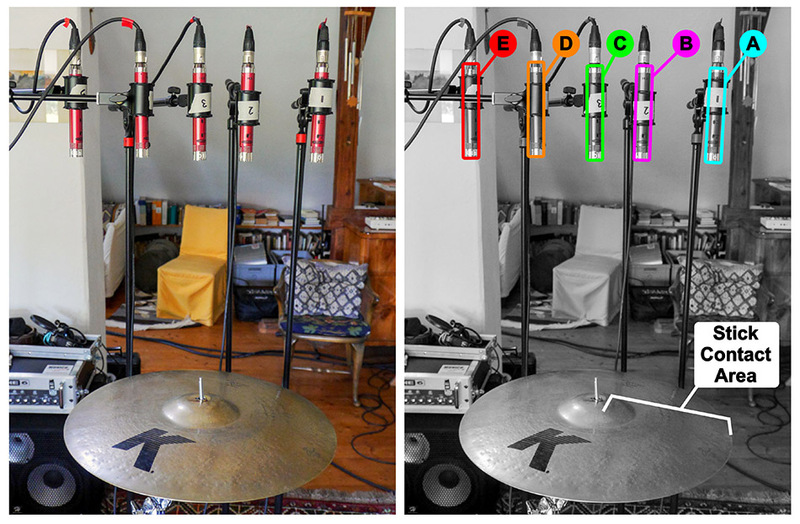 This microphone setup used five Avantone CK1 microophones with their cardioid capsules to record different above-cymbal placements for the same four different cymbals: a nineteen-inch Sabian AAX X-Plosion Crash ('Crash 1'); an eighteen-inch Sabian AA Medium Thin Crash ('Crash 2'); a twenty-inch Zildjian K Custom Ride ('Ride', shown below); and a nineteen-inch AAX X-Treme Chinese ('China'). Positions Above The Cymbal: With the cymbal set up on a stand about 1.3m from the floor, the mics were placed on the horizontal line roughly 45cm above the cymbal surface pointing downwards at five different locations on the cymbal: the player's edge; midway between the player's edge and the bell; directly on the bell; midway between the bell and the far far edge; and the far edge.